After completing his military service, Yam Derfler did what many newly released Israeli soldiers do: He went off to see the world. Only something went wrong in Mexico, when Derfler got sick and couldn’t find a doctor. He ended up in a hospital getting the wrong treatment. Back home after he finally recovered, Derfler found that others had suffered similar experiences abroad, unfamiliar with the local language and medical system. His research revealed doctor-locating apps in specific countries geared to residents, but nothing for tourists. So in 2015, he and three cofounders began building Air Doctor, a platform that lets travelers (or their loved ones) locate an appropriate physician and book an immediate or scheduled appointment. Doctors can be chosen based on location, medical specialty, language spoken and other clients’ reviews. The app went live last summer after the Israeli company won a $3.1 million investment from insure-tech startup studio Kamet, run by AXA at offices in Paris, London and Tel Aviv. 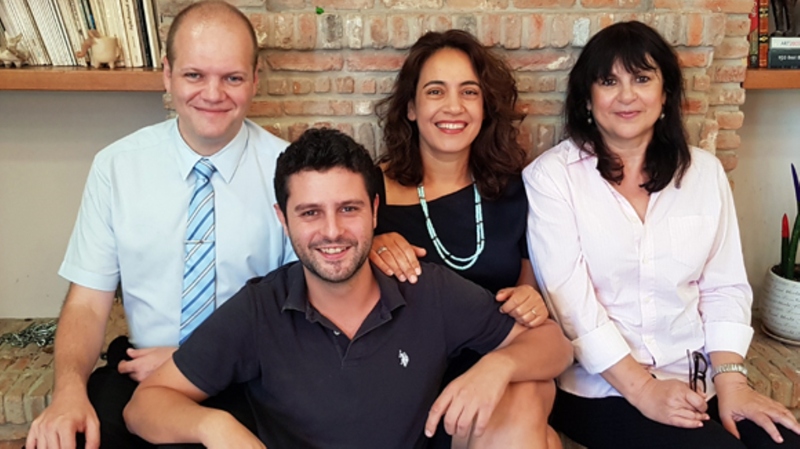 Air Doctor founders, from left, CTO Yegor Kurbachev, VP Bus Dev Yam Derfler, COO Efrat Sagi-Ofir and CEO Jenny Cohen Derfler. “Since we launched in July we’ve seen great success and momentum,” says Yuval Zimerman, Air Doctor marketing director. So far the app has been downloaded on App Store and Google Play about 20,000 times. As of the end of December 2018, Air Doctor functions in some 15 countries and has vetted close to 2,000 doctors. In Israel, Air Doctor has an exclusive partnership with the Phoenix insurance company, enabling anyone holding Phoenix travel insurance to use Air Doctor abroad with no out-of-pocket fees. In other places, you pay the healthcare provider up front and get reimbursed later, although Air Doctor is working on an in-app feature that will streamline and hasten the process. “One of our potential investors is a vice president at a major insurance company, and he loved the idea of Air Doctor because he once fell while on vacation and his company couldn’t help him find a doctor. He had to go to the hospital,” says Zimerman. The app currently works in countries such as Greece, England, Spain, France, Italy and Mexico, and in specific cities including Moscow. Germany, Belgium, Netherlands, Thailand and Peru are coming online soon. Zimerman notes that Air Doctor does not simply link to a list of doctors in a locale. The customer feedback feature enables the startup to take action if there is ever a complaint about a particular physician. The company, which has 17 employees in the Jerusalem suburb of Beit Nekofa, was named one of the top 10 startups of the 2018 MassChallenge Israel accelerator, and was chosen to present at an insure-tech conference next March in Germany.